Every hunter (including out-of-state hunters) born on or after Sept. 2, 2000, must successfully complete a hunter education training course. Proof of certification or deferral is required to be on your person while hunting. Minimum age of certification is 9 years. Single-day in-person course cost is $15. persons 17 years of age and older have the option of taking the course in person or online. the cost of an approved online course varies by provider. For information about various course options, call (800) 792-1112 or visit TPWD Hunter Education. *”Accompanied” means: by a person (resident or non-resident) who is at least 17, who is licensed to hunt in Texas, who has passed hunter education or is exempt (born before Sept. 2, 2000), and you must be within normal voice control. Proof of certification or deferral is required to be on your person while hunting. Cost: $10 – Allows a person 17 years of age or older who has not completed a hunter education program to defer completion for up to one year. A deferral may only be obtained once and is only valid until the end of the current license year. 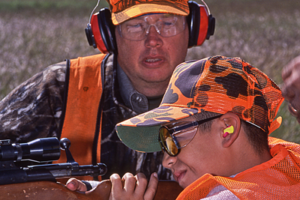 A person who has been convicted or has received deferred adjudication for violation of the mandatory hunter education requirement is prohibited from applying for a deferral. Bowhunter education certification is required on the Hagerman National Wildlife Refuge, Pottsboro. The cost of hunter education certification is $15. For course information, please consult TPWD Hunter Education or call toll-free (800) 792-1112 (menu 6) or call (512) 389-4999.